Open Security Research: Using Mimikatz to Dump Passwords! The key feature of this tool that sets it apart from other tools is its ability to pull plain-text passwords from the system instead of just password hashes. If your intention is to stay within the Windows environment and pass the hash this may not be that big of a deal. However, if you are exploring the curious case of password reuse across different environments—the plain-text password can be quite useful. For example, you have compromised a “Good for Enterprise” server that has a web interface which is not tied into AD single sign on. It might be useful to have the Good admin’s plain-text password to try against the Good for Enterprise web interface. Additionally, unless you have significant computational power, you may not crack an NTLM password hash—thus pulling the plain-text proves useful once again. What the heck is WDigest? 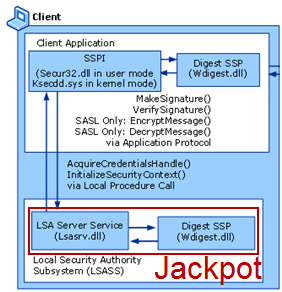 WDigest is a DLL first added in Windows XP that is used to authenticate users against HTTP Digest authentication and Simple Authentication Security Layer (SASL) exchanges. Both of these require the user’s plain-text password in order to derive the key to authenticate—thus why it is stored in plain-text. You should see one entry for each user. Note the msv1_0 and wdigest fields. The former contains the LM and NTLM hashes for the Administrator user (defined by "Utilisateur principal") and the later contains the WDigest entry, which is the plain text password of the user! Running mimikatz remotely, is more or less the same, but if you'll need to establish a connection on the system first. We'll do that here by using the built in Windows net commands and psexec. Serveur connect+¬ +á un client ! Volume in drive \\169.254.73.91\admin$ has no label. Insanely awesome tool--huge thanks to the author for sharing! This capability can be instrumental in leveraging password reuse. This makes another tool to add to the security toolbox for sure. Also note that Hernan Ochoa added this capability to Windows Credential Editor version 1.3 Beta using the "-w" flag. Got some tips of your own? Let us know in the comments below!!! Thank you for the post. I was wondering if you have had any issues deleting the sekurlsa.dll file after injecting? I am testing this exact scenario and have successfully dumped the information but am unable to delete the injected .dll --- obviously because it is in use. I had to remotely kill the process. All is well. it's just maybe because you don't unload sekurlsa.dll ( use "@"), or a proper "exit" in mimikatz (automatic unload...). Thanks! Actually that was there in the original version of this blog post but I somehow cut it out in transforming it from .txt to HTML. Fixed it above.. btw - great tool man! I am a beginner but i need to ask one thing. It returns passwords of the logged in user, right? I opened a session using meterpreter, got the shell and ran it, and got passwords of logged in user. But what if i need passwords of other accounts as well? How do i do that, given user is logged in using his account only! but no passwords are displayed. Your help/thoughts would be appreciated. This will save the output to a file, making it even easier to collect your data. You can always change the path to make it easier to collect results, even upload to fpt etc! thanks, seems nice, no need to download mimikatz then, got it. but unfortunatly, i can not make the privilege::debug to the invoke option. any idea how to ?